Elemis Enhancement – 3 months detoxification plan, experience the Elemis difference in body detox programs. This 3 month body detox program will cleanse the body of toxins while promoting weight loss and increased energy. Elemis Cal-Metab Capsules: helps increase the bodys ability to burn up calories by balancing metabolism and may be used for weight loss and cellulite reduction. It cleanses the blood while supplying essential vitamins and minerals, including a high content of organic iodine that helps balance thyroid – necessary in helping the body burn off excess fat and regulate the texture of the skin. 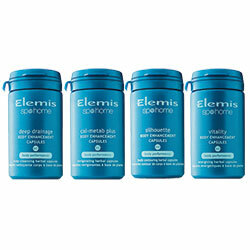 Elemis Deep Drainage Capsules: gently stimulates and helps eliminate toxins and improve sallow complexions. Elemis Silhouette Capsules: helps to effectively purify the blood and increase the body’s fat burning ability. Elemis Vitality Capsules: helps improve energy levels, increase stamina, stimulates circulation, and combats tiredness. Raphanus sativus powder is another name for powdered black radish, a plant related to the cabbage. According to Viable Herbal Solutions, Raphanus sativus has been used since the time of the ancient Egyptians as a digestive aid, a diuretic and a powerful liver and gall bladder stimulant. Mentha piperita is the scientific name for the peppermint plant, and, like black radish powder, it has been used as a medicinal herb since ancient times. Peppermint is thought to increase the function and efficiency of the digestive system, to stimulate the production of bile and to relieve nausea and tension. This powder is derived from the silky threads, known as corn silk, that are found on the inside of corn husks. Corn silk powder is thought to be beneficial for the organs and function of the urinary tract. Viable Herbal Solutions reports that corn silk powder reduces inflammation within the kidneys and bladder and prevents excess water retention. Petroselinum sativum is the scientific name for the parsley plant. Parsley leaves were used by ancient Egyptian and Greek healers as an herbal treatment for kidney, gall bladder and digestive system disorders. Parsley leaf is also thought to be an effective diuretic. According to Viable Natural Solutions, this leaf powder is derived from the plant known as psyillum or branching plantain. The plant grows naturally in the Mediterranean, the northern portions of Africa and in the Middle East; the portion used as a medicinal supplement is most often the outer husks from the plant’s seeds. Plantago ovata leaf powder is a powerful laxative and, while in the digestive tract, is thought to absorb microbes and toxins because of its ability to swell with water before passing from the body. Powdered kelp is included in Elemis Deep Drainage Capsules because it is thought to both promote the function of the body’s glands and to bind to and remove toxic heavy metals, chemicals and drugs from the body. This powder is derived from the bearberry plant, a plant belonging to the same family as the blueberry plant. Both the leaves and the fruit of the bearberry plant have been used for generations in folk medicine traditions around the world as a stimulant for the liver, kidneys and pancreas, as a diuretic and as an anti-inflammatory agent for the urinary tract. Galium algae powder is another name for the powdered cleavers plant, a plant used to promote the health of the lymphatic system. Viable Herbal Solutions reports that cleavers stimulates lymphatic drainage and this drainage is thought to detoxify body tissues. Laminaria extract is an extract of the algae, or kelp, laminaria. Its function is similar to that of the powdered kelp also included in the Deep Drainage Capsule ingredients: it promotes glandular function and it is believed to remove toxic substances from the body.